Jane at SmallButCharming hosts these wonderful Flowers in the House parties. I always love to see what Jane has around her charming abode. Jane is in the business of flowers, so it's always very creative and wonderful. It's also fun to get a peek into others' homes as well. Go check it out here. As if I need any further convincing...I continue to use my chalkboard as a backdrop because I love the color and how colors look against it. I'm planning to paint a few rooms in our new (old, circa 1900) house in this color and maybe one quite a bit darker. The flowers are actually left over from Valentine's Day. The tulips are long gone, but these little guys continue to make me happy. I gathered my collection of books (mostly from Madeline's book shelves) and my amber bottles thrifted at my favorite flea market. Still adore my glassybaby in the color BFF. Very pretty--the perfect little flowers! Ahhh, here's your post and well worth hunting for believe me. Lovely, lovely, lovely flowers and things. And that is one pretty pink glassbaby. Very pretty mix, I really need to add some colour to my house, roll on pink peony weather. So pretty!! I've got some tulips on our breakfast bar that always bring a smile to my face. sooo pretty! I can just imagine how amazing the posts in your new old house will be! Ooo, wax flower! Jane said these are the flower of the year, and I believe she's right. I'm seeing tons of it all over flower shops in the Bay Area. You are right that the color looks amazing against black. Must get a glassybaby sometime. Oh how lovely ~ Thanks for turning me on to "Small But Charming." I actually have flowers in my house, and blogged about them this morning. Next time I'll watch for the party so I can properly link up. Lovely little blog you have here! :) I shall bookmark it and drink in the lovely photos in detail more soon! 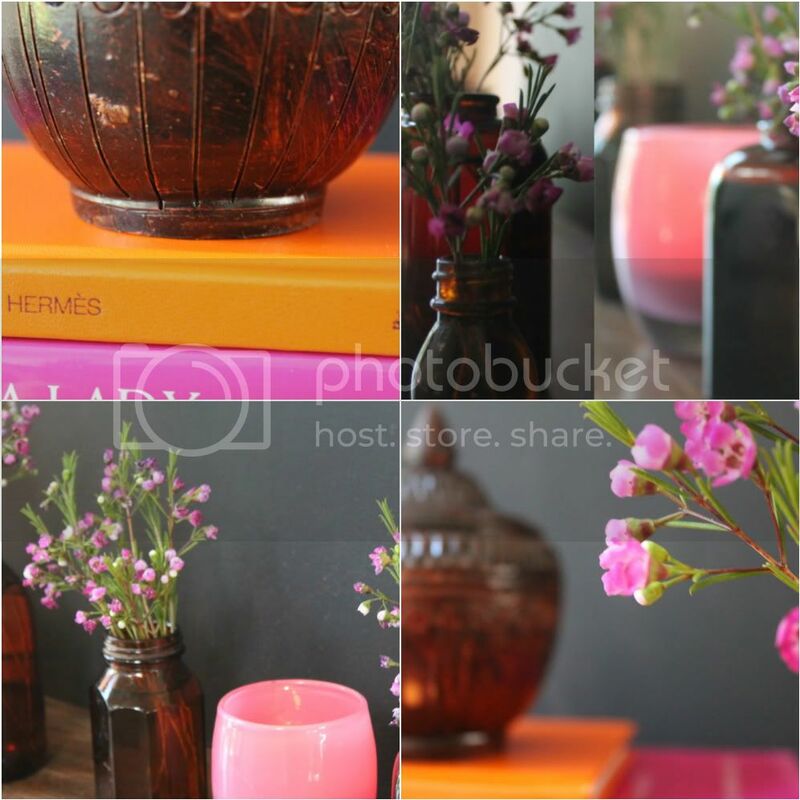 The POP of color in the wax flowers and books looks like the beginning of Spring! So cheery!! You have inspired me to add smaller groupings of flowers around my home! the pink against that charcoal wall is just gorgeous. annie i cannot wait to see your new/old home. i bet you can't either. you must be on pins and needles. The colors are so pretty. I still have some bits that I am enjoying from my Valentines' flowers too. You are so right about the black. It really makes everything pop. Wow! I used a chalk board yesterday as a backdrop to flower photos, and decided today to paint the walls above the wainscotting in Benjamin Moore's "wet cement". I love the glass! Annie, I love your pictures today!! Your flowers look so pretty with the chalkboard backdrop - and of course your glassybaby looks great in the mix. I love the pink and orange and amber together. Very pretty vignette! love the glassybaby!! great vignette! I am learning so much on this month's flower tour. I just learned about wax flowers a moment ago, and now Glassybabies. (I do love Google.) And using a slate chalkboard as a photo background, what a clever girl you are. Lovely photos. Beautiful photos & I love the colours! I love your little vignette! The colors are absolutley lovely. Love the new "treasure" you found! as always you really do inspire with the most lovely things. each time i visit i want to capture it all on canvas.